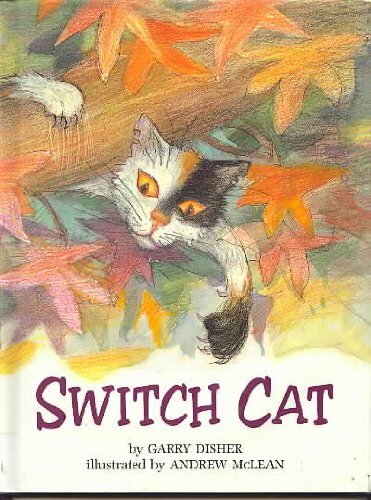 “Switch Cat” has a surprisingly poetic text. It describes a little girl with “handwriting like a puddled street,” and instead of messy hair, author Garry Disher writes that she has “frenzied” hair. I was baffled by the text at first, since it seemed like a freeform poem that just doesn’t rhyme. Its short sentences present two girls who live next-door to each other, and two cats which are correspondingly neat and messy. The messy girl loves a cat named Ms. Whiz. (“Scruffy, torn, fishbreathy, mean, a mad-eyed spark on the trunks of trees. Grubby, worn, sunloving, lean, trample-purring around my knees.”) That’s probably the book’s best rhyme, though the rhythm keeps changing throughout the book, and some of the other rhymes it presents are also much looser. The problem is that the messy cat lives with the tidy girl – Evangelina – while the sleek and tidy cat (Ev) lives with Cecilia. “No wonder I offend,” says the messy girl, as she describes how her fussy cat slips next door to Evangelina’s tidy room. Author Garry Disher is an Australian writer who’s written 13 crime novels with titles like “Chain of Evidence,” “Crosskill” and “Deathdeal.” But in this book, the big switcheroo happens spontaneously – the cats just like it this way – and the real crime is that eventually Evagelina moves away, taking her messy cat with her! It’s easy to get confused, especially since the short poetic descriptions are a little low on details. There’s illustrations by Andrew McLean, but they’re simple color pencil sketches. McLean also uses water colors and gouache, according to the book’s copyright page, but most of the drawings still look like plain old color pencil sketches. I do like that they fill up most of the page, so there’s always a nice big color illustration. (I think they call this the “oversized” book size.) And they do provide lots of glimpses at the cats and their playful activities. The book eventually finds its way to a happy ending – though I’m not exactly sure what happens. But somehow the cat escapes from its new home, and travels back to the book’s narrator.